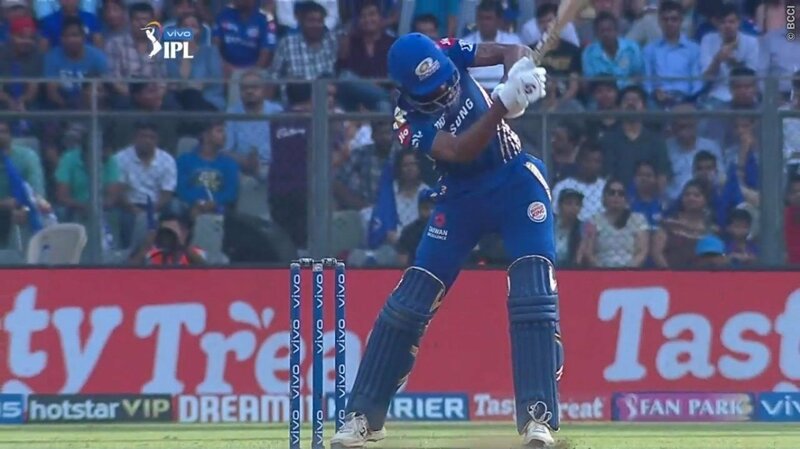 Mumbai Indians all rounder Hardik Pandya played the helicopter shot to perfection in the ongoing IPL 2019 match against the Rajasthan Royals at the Wankhede Stadium in Mumbai on Saturday. Mumbai Indians were in need of a strong finish when Pandya came out to bat with the scorecard reading 136/3. Pandya, who has been instrumental in finishing matches for Mumbai this season, once again came good with an unbeaten 11 ball 28 to propel the team total to 187/5 in their allotted quota of 20 overs. Pandya played the shot of the innings on the last ball of the penultimate over when he pulled off the helicopter shot for a maximum off the bowling of Joffra Archer. Pandya was standing deep inside the crease waiting for any slipups in length. Archer missed his yorker by just an inch and Pandya swung his bat with all his might to send the ball deep into the stands at the Wankhede. Earlier in the day, Rajasthan Royals captain Ajinkya Rahane won the toss and decided to bowl first. It was opener Quinton De Kock who stole the show with the bat as he hit a 52-ball 81 with 6 fours and 4 sixes to set the tone for the home team. With regular skipper Rohit Sharma back in the playing XI, he opened the batting with de Kock and the two took the Royals bowling to the cleaners from the word go. The visitors had something to celebrate when Rohit was dismissed by Joffa Archer after scoring 47 off just 32 balls. Coming in at No.3, Suryakumar Yadav too looked to build on the strong start, but managed to score just 16 off 10 balls before Dhawal Kulkarni cleaned him up. Kieron Pollard too failed to make an impact as he was dismissed by Archer, with the West Indian looking to hit the West Indies born English bowler out of the park. The final flourish to the innings was provided by Pandya, who smashed a four and 3 sixes en-route to an unbeaten 11 ball 28 as Mumbai finished with 187/5 in their 20 overs. The Gunners are reportedly after Ajax Brazilian ace and planning to grab him this summer.